In preparation for their return to the legislature this week, MLAs from Alberta and Saskatchewan have been meeting with students in their electoral districts. 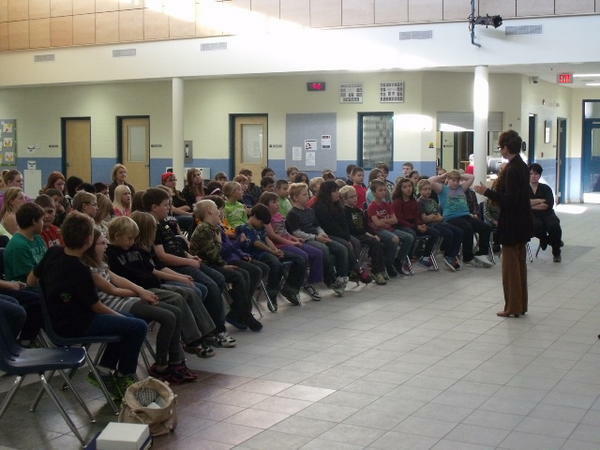 The students prepared for these visits by learning about the responsibilities of the provincial government and their MLA, as well as some current events that were important to them. During their time with the MLA, students asked questions about a wide variety of issues, from pipelines to social policies to voting. MLAs Jacquie Fenske and Linda Johnson tweet about the questions they received on MLA Day. The goal is that these MLA Day visits have not only highlighted issues of importance for MLAs to bring back to the Legislature this term, but also have begun a year long relationship between the students and their elected representatives. Some MLAs have already scheduled follow up visits with their partner school. CIVIX is excited to announce the launch of MLA Day in Alberta and Saskatchewan! MLA Day brings together high school students and their provincial elected representatives (Members of the Legislative Assembly, or MLAs for short) to discuss political issues and current affairs. MLA Day provides students an opportunity to voice their opinions and begin a relationship with their elected representative. MLAs will have the chance to shed negative stereotypes associated with politicians. “We hope that by connecting students with their elected representatives, we can create stronger bonds between the province’s youth and democratic institutions and values,” says field commander Katie Reidel. Through online resources, classroom discussion and interaction with their MLA, students will increase their knowledge of their provincial legislative assembly, develop trust in their local representative, and be encouraged to discuss future issues facing the province with family, friends and government officials. Ideally, the issues discussed on MLA Day will remain with each MLA as they return to their respective legislatures the following week. Past Student Vote Team Leaders in the two provinces were invited to register for the program. Student Vote, another CIVIX program, ran its most recent parallel elections in the provinces of Alberta and Saskatchewan. In Alberta, 85,186 students elected a PC majority government led by Premier Alison Redford in April 2012. In November 2011, 20,001 Saskatchewan students elected a Saskatchewan Party government under Premier Brad Wall. We would like to thank all the MLAs and schools from across Alberta and Saskatchewan who took part for their participation and patience throughout this pilot program. We’d also like to thank Murray Mandryk of the Regina Leader-Post for writing a piece to help Saskatchewan students prepare for the upcoming legislative session. For more updates on MLA Day, follow CIVIX on Twitter, Facebook and Pinterest! You are currently browsing the archives for the MLA Day category.